I finally got to hold my baby. He was 9 days old. I look back on this experience with fondness. I admit that I felt robbed of normalcy with this birth. I would have loved to hold him and look at him right after he was born. I would have loved to have taken him home a day or two after he was born, I would love if he wasn’t sick…..but as soon I say these things I immediately feel a pang of guilt because I am blessed beyond words to have this boy here with me today. As I reflect on our heart journey and those days following Oliver’s surgery I am at a loss for words. Our journey was easy compared to most. We had few complications and struggles. I have tried to compose my next blog post about the recovery stage before we came home and I cannot seem to come up with anything. I have seen much heartache in the heart world during our short 11 months of officially being part of it. I have seen much heartache even in the past 3 weeks. I cannot stress the importance of hugging your children tightly, often. Hold them, kiss them, and spend time with them. Thank your Father in Heaven daily for letting them be with you still. Life is so precious and can change too fast. I am reminded every day of just how thankful I am that our journey was quite easy. 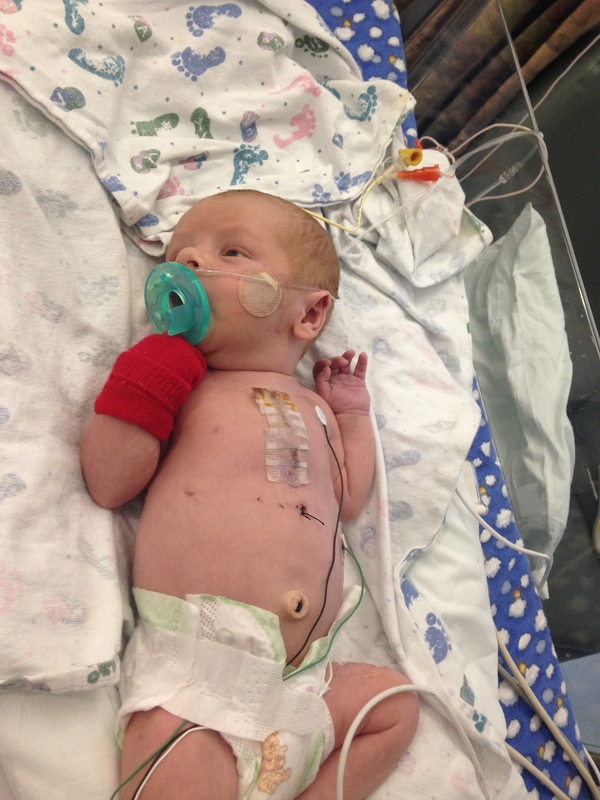 After Oliver’s surgery he stayed in the cardiac intensive care unit for one week and was then moved up to the third floor and stayed there for a week and a half. 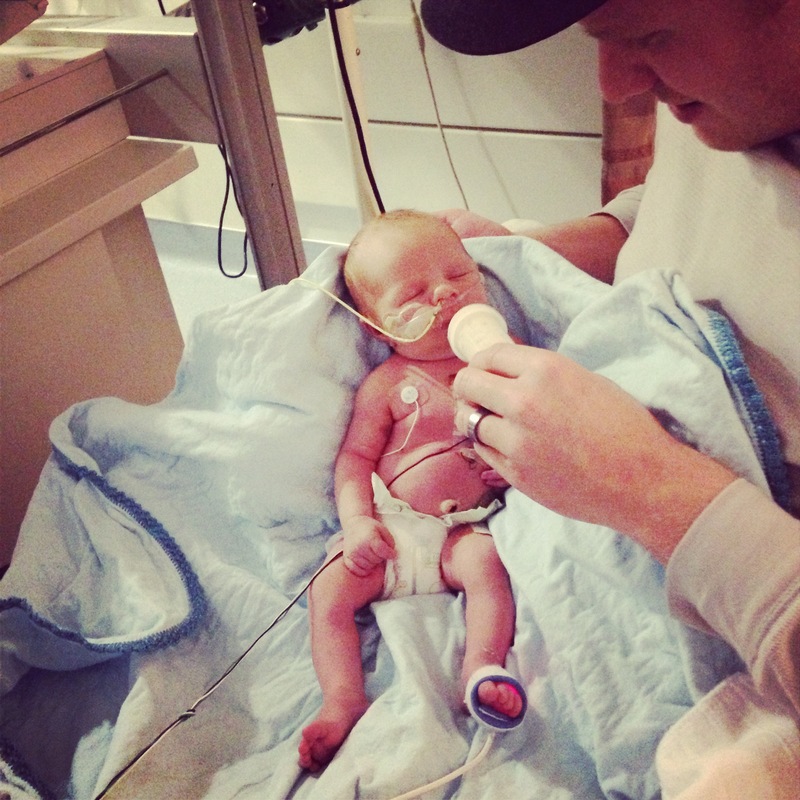 During our time up one the “floor”, we learned how to administer his medication, learned CPR, proved we could reinsert his feeding tube, and got to be his parents. I felt exhausted and overwhelmed, but thankful that all was going well. With a feeding tube you can have what they call a continuous feed where they get small amounts of food constantly, or bolus feeds where they feed a large amount every few hours (which is how you and I eat). The transition from continuous to bolus was hard. Oliver would scream for hours as his belly was adjusting to the new feeding schedule. 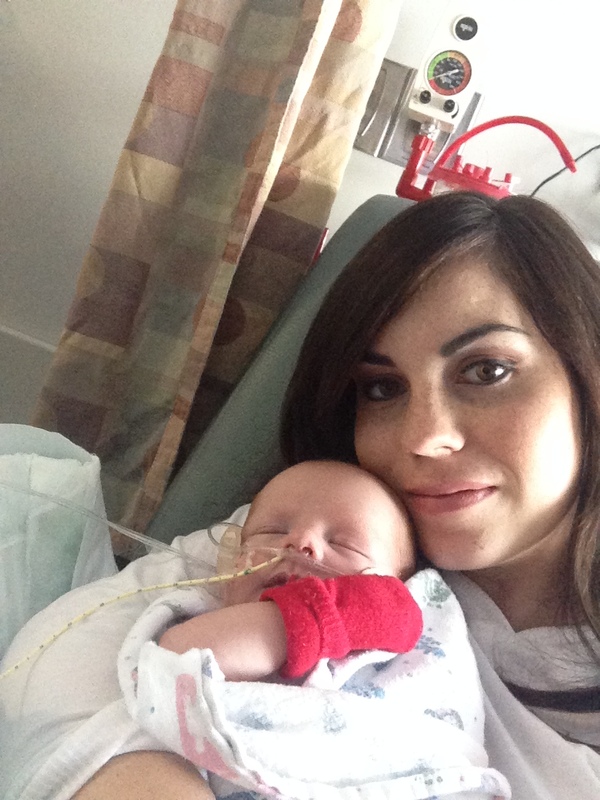 In order for Oliver to get the feeding tube removed, he had to pass a swallow study. In the swallow study he had an x-ray while ingesting barium. I was so nervous for his first swallow study and said many prayers that he would pass it. 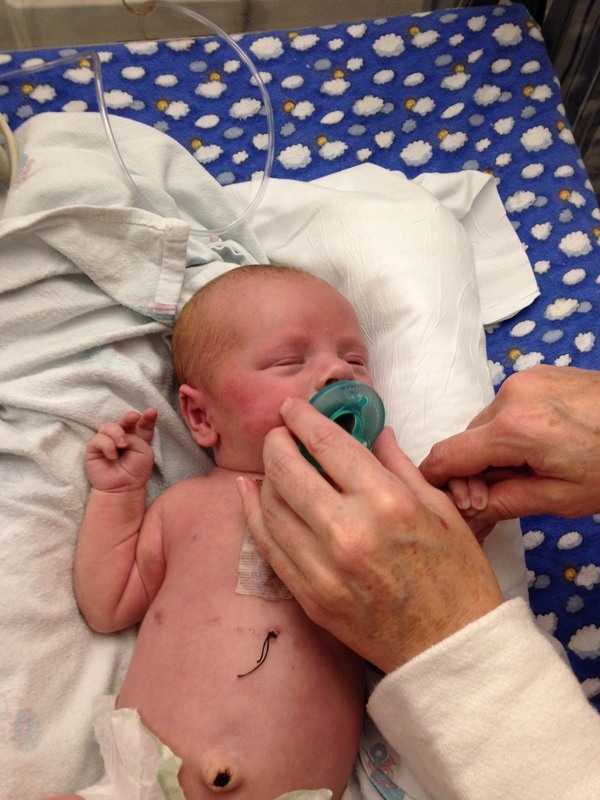 I selfishly didn’t want to have to deal with the pain of a feeding tube and oxygen when we brought him home. I put on my apron in the x-ray lab and watched as he failed his first study. 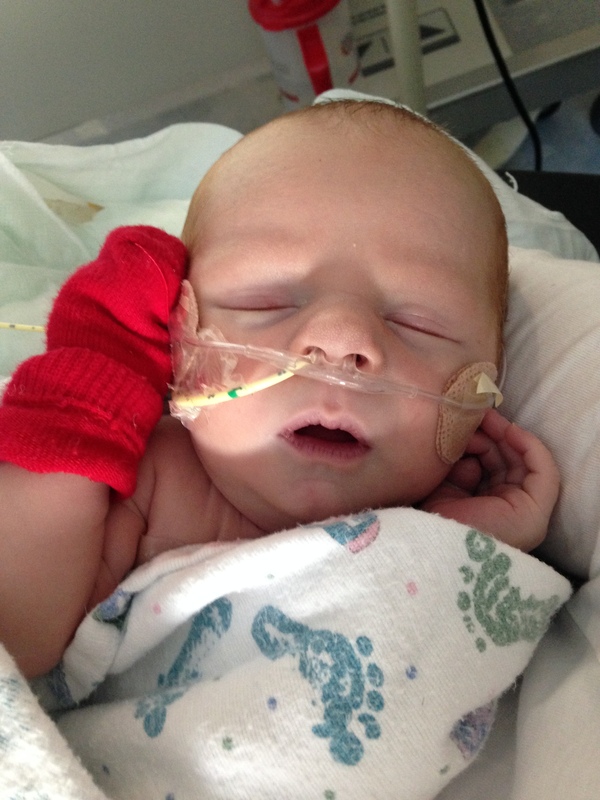 He aspirated on the liquid and was still doomed to have the feeding tube. I had fought to get him his first swallow study and was sad that I had possibly made the wrong decision. The one bright side to the whole situation was that he successfully swallowed a thicker substance that they call nectar thick. This meant that we could give him small amounts of thickened milk so he could practice eating. Over the next few days we diligently tried to feed him by mouth with the assistance of a speech therapist before each bolus feed. He hated it and was too tired to eat. We thickened his milk with a powder called Thick It. We were given permission to try baby bananas as an alternative to Thick It. The enzymes in the breastmilk break down rice cereal too fast so Thick It and bananas were our only option. He LOVED the bananas and we were so thankful. We started with 10 ml’s and gradually worked our way to an ounce. I was determined to work hard on feeding by mouth because I felt that the doctors and nurse practitioners were not pushing as they should, and that Ollie would be going to kindergarten with a feeding tube. I now know that this was nonsense and that I was being crazy. The nights were long as we tried to sleep in the hospital with a nurse or tech in his room every few hours. We slept on a small couch each night. A few nights we left the hospital and stayed at my moms friend Michelle’s house. It was extremely hard to leave Oliver but necessary. We were so tired. 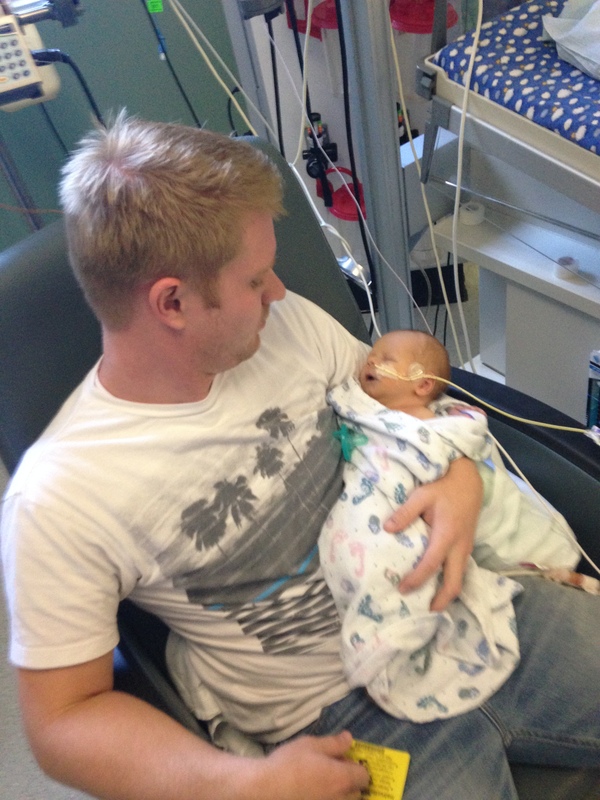 When we stayed at the hospital, David and I would take turns holding Ollie, feeding him, and changing his diaper. This time was hard because we were trying to manage his pain. He went from morphine, to oxycodone and tylenol. We were tired and anxious to get back to the comfort of our own home. Each day we were told we could possibly go home in a few days. It was very frustrating, but we trusted that they had Oliver’s best interest in mind. On Halloween day we were finally given the clear to go home. We were very anxious and excited. The day was spent cleaning up our room that we had been living in, getting oxygen ordered from a home health company, getting in touch with a home health company in Idaho to meet us as soon as we pulled into town, and learning about the High Risk Clinic. The high risk clinic was a program Primary Children’s started to lower the mortality rate of young HLHS patients between their first and second surgeries. Each day we were to weigh Oliver and write it down in our binder, record the medicine we administered to him, and record how much he ate each day. We were told the importance of keeping him away from the world. We were to keep him indoors and away from human contact as much as possible. 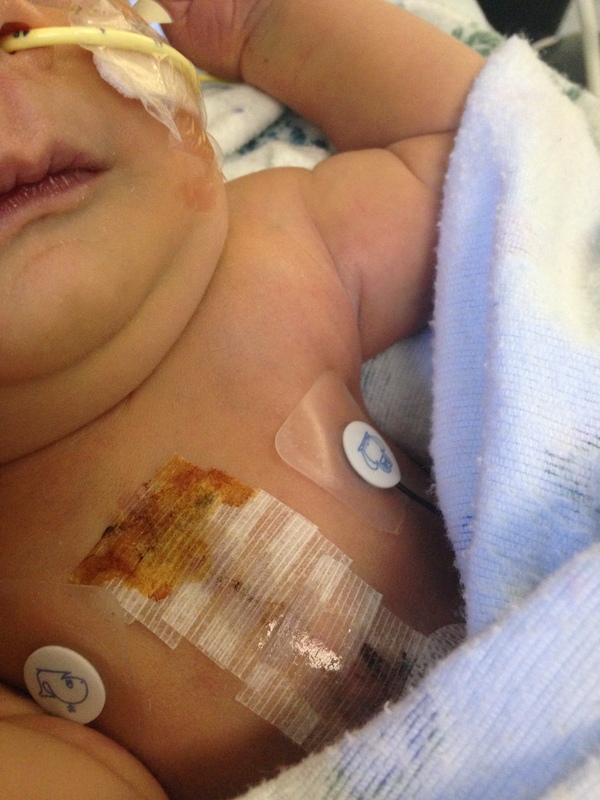 These heart babies are very prone to respiratory infections and sickness. We should wash and sanitize constantly. Oliver would need to see his pediatrician within one week of being home, and then seen once a week until we got the clear to make it longer. He would see his cardiologist in one months time. We were to feed him whenever he wanted food. It felt like a huge weight was put on our shoulders at the time. 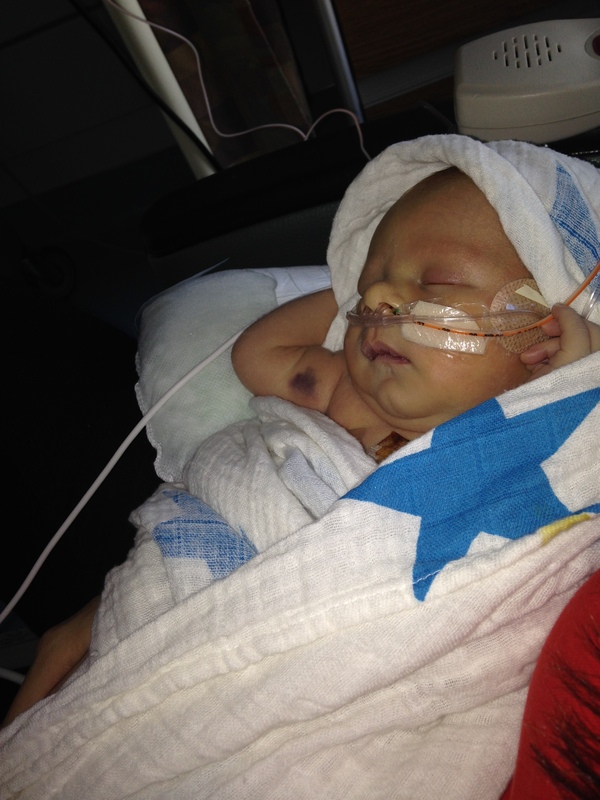 If I can give any advice to the parents of sick children at this very moment….it would be to relax and calm down. You will get the hang of all of it and it will be your normal. 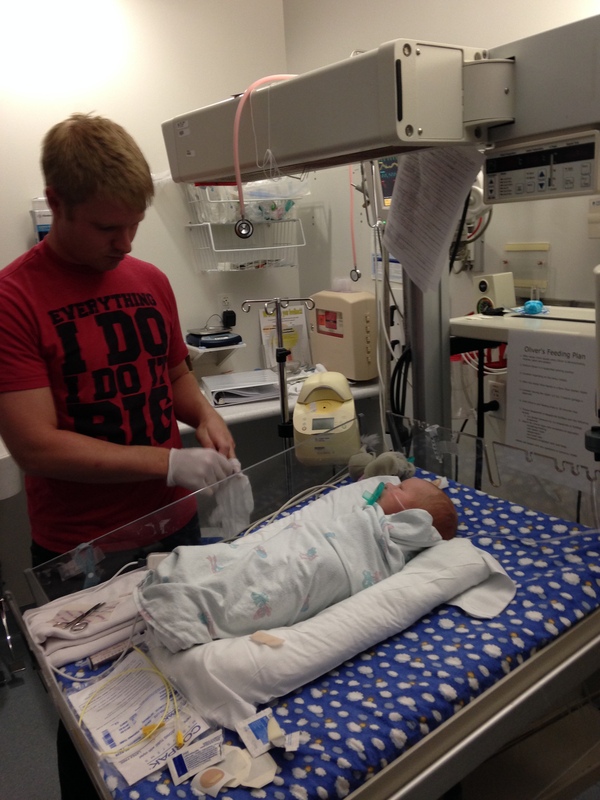 That day at the hospital we learned how to hook up an oxygen tank. I was so terrified the thing would explode. Luckily it didn’t and we survived the oxygen ordeal. Halloween day at the hospital was full of fun! That morning all of the children were invited to pick out a Halloween costume and they then got to trick or treat and play games. Ollie didn’t dress up, but he got his picture taken and put in a cute little pumpkin frame (I laugh every time I look at it cause its so cute). After a few long hours we were finally able to leave. 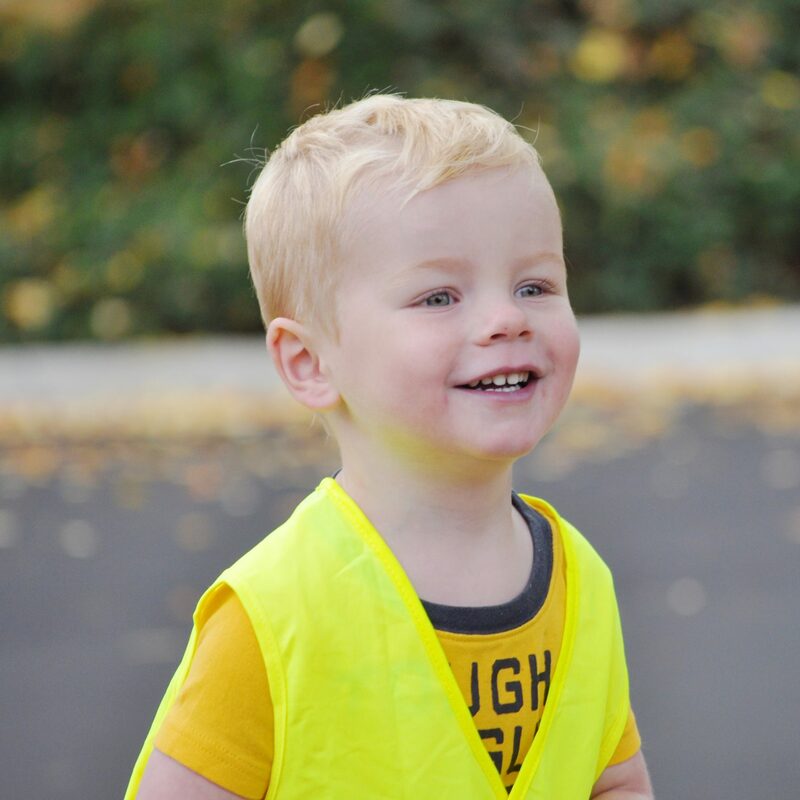 We left the hospital carrying a scale, feeding tube supplies, an oxygen tank and supplies, diapers, thick it formula, and our most prized possession…Oliver! He got to wear clothes for the first time in his life at 2 1/2 weeks old. 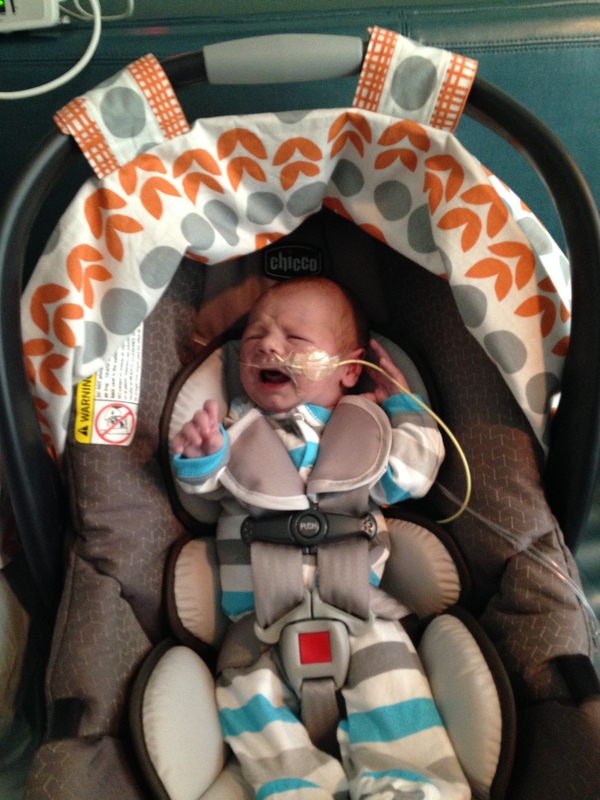 He practically disappeared in the car seat when we put him in there for the first time. When we walked out of the hospital some one was playing a beautiful song on one of the grand pianos. 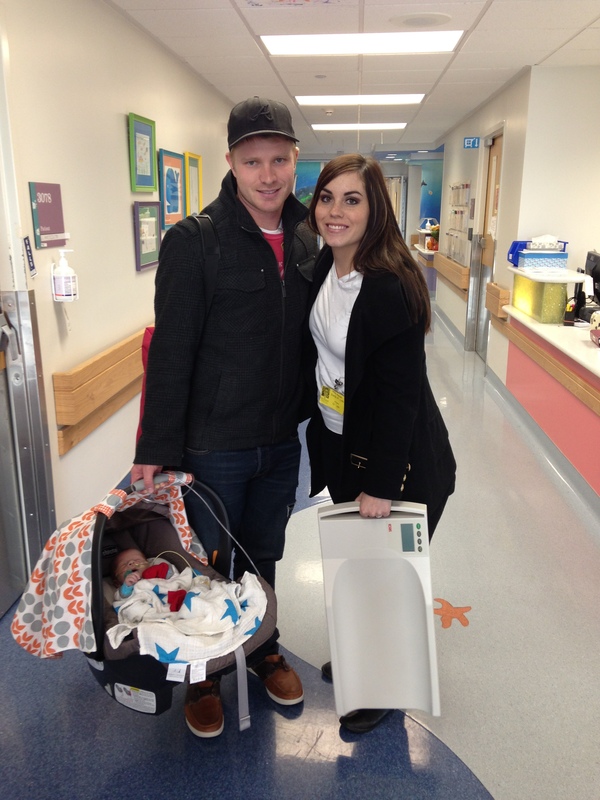 I felt overwhelming gratitude that we were walking out those doors with our baby that day. I hear this song every so often on my pandora station and get that overwhelming feeling all over again. I remember vividly riding down the elevator and loading Oliver into our car. It is a special moment in our lives that I will cherish for as long as I live. I’m so overwhelmed by reading your story. I want to say thank you for sharing the experiences you had to go threw. This has truly touched my heart in so many ways. I can’t even imagine what you guys had to go threw. You are amazing parents and the strength you have is so inspiring.